Slowly and secretively, your blood-sugar levels can creep up. When that happens, you might notice that you feel sluggish, hungrier than usual or have blurred vision. Or maybe you don’t realize it until after a blood test reveals that your glucose levels have spiked. High blood sugar, known as hyperglycemia, can result from a diet rich in carbohydrates and sugar. A sedentary lifestyle with little exercise is also a culprit. However, even people who try to eat healthily and stay active can see their blood sugar levels spike because of stress, an infection or other medical reasons. Many people’s blood sugar levels increase as they get older. That’s because aging is associated with a potentially hazardous decline in how efficiently our body regulates our blood sugar levels. If left unchecked, high blood sugar could lead to some of the most-undesirable diseases known to man, such as diabetes and metabolic syndrome. A healthy diet and active lifestyle are the two most important factors in keeping your blood sugar at a healthy level. But there are ways to bolster this process even further, my favorite being cinnamon. 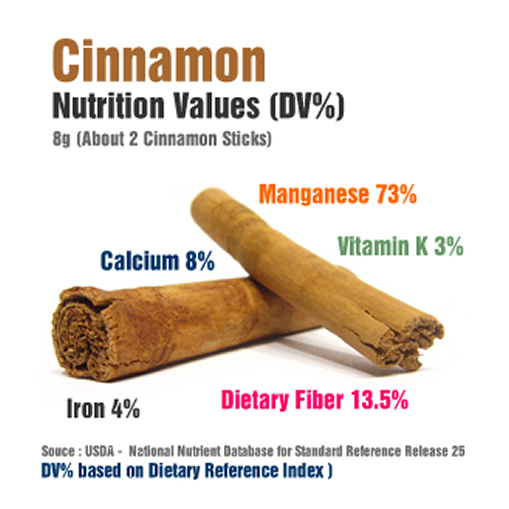 Not only is cinnamon delicious, but it’s proven to be one of the best natural ways to effectively manage blood sugar levels. For example, just half a teaspoon of cinnamon a day has been shown to significantly reduce blood sugar levels and triglycerides. Another study found that the spice increased glucose metabolism by about 20 times, which would significantly improve your ability to regulate blood sugar. This spice can also lower your blood sugar by acting in several different ways in the body. "Polyphenols from cinnamon could be of special interest in people that are overweight with impaired fasting glucose since they might act both as insulin sensitizers and antioxidants." Here in the Uncommon Wisdom Daily office, many of us like to add cinnamon to our coffee. It’s a delicious way to start the day, and a healthy one. In order to reap all the benefits of cinnamon, it’s crucial you buy the right kind. The kind of cinnamon you find in most grocery stores is a variety called cassia cinnamon. But cassia can contain high levels of coumarin. This naturally occurring ingredient could, when eaten in large enough amounts, cause reversible liver toxicity. Some experts suggest investing instead in Ceylon cinnamon, a milder — and pricier — variety of the spice that comes from a tree distinct from, but related to, cassia. Ceylon cinnamon can provide all the incredible benefits we talked about above, but without the risk of consuming too much coumarin. Does ceylon cinnamon come as a tablet? Since some feel this is a myth, are there reputable studies to back this claim? Were you find ceylon cinnamon?? The myth that cinammon (or now Ceylon cinnamon) can control blood glucose levels or even cure diabetes has been around much longer than Brad Hoppmann. If this were true, than one would think the rate of diabetes in IndoAsia would be quite low. But this subcontinent has a growing incidence level of diabetes. And yet, people here have been using cinnamon, tumeric or curcimin as a staple in their diets for centuries. I am a diabetic 2. You really should have mentioned the two varieties of cinnamon much higher in the article. I’ve known about it for years, and have this conversation myself from time to time, and that fact is always a point of confusion. Mention the type early and often in the article. Otherwise you’ll get people buying the Costco (or maybe a restaurant supply store) Jug-o-Cinnamon and OD-ing on the wrong type thinking they are doing themselves a great favor. It makes a very interesting and helpful reading. How and where can I get Ceylon cinnamon, please? How to tell difference between cassia cinnamon and Ceylon cinnamon? Admittedly am very gullible to trying health improvement/maintenance suggestions, so I hope your research is thorough and expert. I enjoyed the article, partially because I enjoy the aroma of cinnamon since I use it in my culinary but most important the information that was shared. Thank you so much, my blood sugar has gone up to 495, today I’m at 200, thank you for your help.